There's no point sending the file. I see that you've been taking search volume from different sources in Rank Tracker and manually. I can send you the Rank Tracker file if you like!! I 've worked out the maths now. It seems that RT was giving me daily search volume. If I multiplied that column by 30, it all fell into place. Regarding the tool. I was using Wordtracker, but I'm now using Google Adwords - which is giving me monthly search volume, and so the maths is making sense. Which tool are you using to check number of searches? (You can check that in Preferences -> KEI Settings -> Number of searches) I don't see where you can get 557 for storage sheds. RT is calculed KEI correctly (just checked it on a number of keywords). The point is I don't believe you've got 557 for search volume in Rank Tracker. Please could you check this out? I've copied the results that Rank Tracker has generated into a spreadsheet, and created an extra column using the classic formula, and it generated completely different KEI figures. 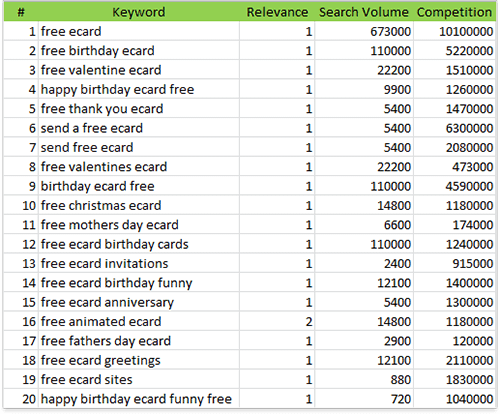 I've also ordered my results byt KEI(R) and at the top of the list I have a high number of keywords that I've marked 3 in the relevance column. As these words clearly aren't relevant to my website, should I just ignore them? the "allinanchor" improvement you're talking about lets you find competition among the pages which are obviously <i>being optimized</i> for your keyword. 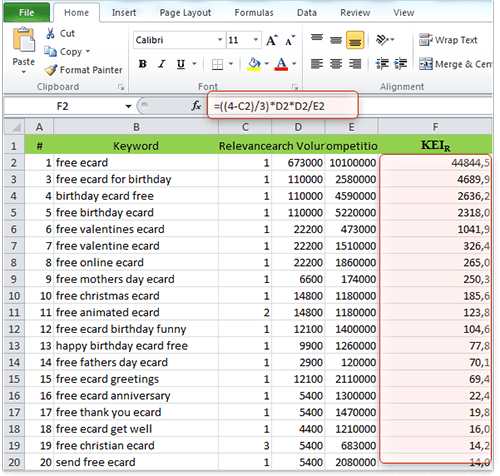 The classical KEI formula works with the competition among pages that are <i>ranked</i> for your keyword. What if a page's owner did not purposefully optimize the page, but it's still ranking? You might miss it if you're using the KOI formula. Still I'm not 100% againgst KOI here (though not really using it as much as KEI). It rather has to be a matter of your choice. Thank you very much for sharing your experience. The book is really helpful! where P is Popularity of the keyword (actually P is Google's result when searching in anchor texts only: allinanchor your_keywords). Obviously your formula gives weight to relevance of the keyword, while David's one uses more concentrated on subject search results. However, having little experience with SEO, I cannot figure out what are the pros and cons of your formula vs David's KOI. Would you mind to clarify this? Also, which formula uses RankTracker to display KEI? I guess it is the improved one, isn't it? Yes, Ken, you're quite right! Hey! Thank you for clarifying KEI. That was the a question I had from the previous lesson. It's a bit of a challenge using KEI when you might have a fairly 'obvious' list of KW's. For example, say I wanted to create a mini-site (5 to 6 pages) focused around one KW: "Round Plastic Tray", now my list of KW's may include, "Black Round Plastic Tray", "Green Round Plastic Tray"(remember, I want the site to be "super-focused", I'm using an extreme example here), so as long as KEI is in the green I'm good to go. Don't really need to do any calculations. Have I made an acceptable conclusion?